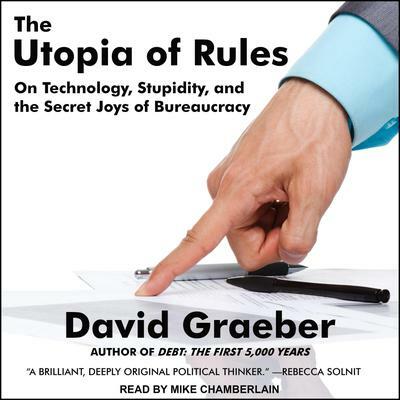 From the author of the international bestseller Debt: The First 5,000 Years comes a revelatory account of the way bureaucracy rules our lives Where does the desire for endless rules, regulations, and bureaucracy come from? How did we come to spend so much of our time filling out forms? And is it really a cipher for state violence? To answer these questions, the anthropologist David Graeber—one of our most important and provocative thinkers—traces the peculiar and unexpected ways we relate to bureaucracy today, and reveals how it shapes our lives in ways we may not even notice . . . though he also suggests that there may be something perversely appealing—even romantic—about bureaucracy. Leaping from the ascendance of right-wing economics to the hidden meanings behind Sherlock Holmes and Batman, The Utopia of Rules is at once a powerful work of social theory in the tradition of Foucault and Marx, and an entertaining reckoning with popular culture that calls to mind Slavoj Zizek at his most accessible. An essential book for our times, The Utopia of Rules is sure to start a million conversations about the institutions that rule over us—and the better, freer world we should, perhaps, begin to imagine for ourselves.